Technological advances are increasing the utility and versatility of DR.
With many hospitals and imaging facilities in the United States having replaced CR—and, in some cases, film—with DR, the benefits of digital imaging can be more fully realized than ever before. These include improvements in workflow and staff productivity, high image quality, the ability to postprocess images for added information and clinical value, and the implementation of AI and machine learning. In 2019, DR remains an important primary imaging technology that delivers the information physicians need to make a diagnosis or set a path for continued clinical investigation. Jay Aboujaoude, managing director of the X-ray business unit of Canon Medical Systems USA, says DR is a $2 billion segment and also the largest reimbursed segment in the United States. Radiologist Paramjit Chopra, MD, founder of Midwest Institute for Minimally Invasive Therapies, or MIMIT Health, in Melrose Park, Illinois, notes that there is currently a very significant reimbursement penalty of 20% on Medicare claims for imaging exams with screen film X-ray systems. “A new law has added a 7% reduction for computed radiography exams, which will increase to 10% in 2023,” Chopra says. The main procedures that MIMIT Health uses DR for are plain radiography and breast imaging. Chopra believes that DR accomplishes the dual goals of increased efficiency and better patient outcomes. Vikram Krishnasetty, MD, vice president of Columbus Radiology, a Radiology Partners practice in Columbus, Ohio, says DR imaging is in widespread use among hospital facilities and is useful for quickly transferring imaging to subspecialty radiologists. Krishnasetty calls DR an essential part of the radiology workflow. Joe D’Antonio, director of radiography, fluoroscopy, mobile, and twin robotic X-ray products at Siemens Healthineers North America, says the core technology is fairly stable now, with a move to wireless detectors seemingly being the standard. He also sees more of a focus on automating systems so radiologists can devote more time to patients and less time to pressing buttons and other routine tasks. Sarah Verna, Carestream’s worldwide marketing manager for X-ray solutions, says radiology departments have embraced DR technology, which offers increased productivity, a lower dose than CR, enhanced image quality, and fast access to images that enable physicians to make a rapid diagnosis. Guillermo Sander, director of marketing, digital radiography for Konica Minolta Healthcare, says there is potential to discern more information from every DR image, accomplished through the use of advanced postprocessing and, in the future, AI-enabled tools. Sander says that, although there is a lot of excitement and “noise” around AI, there are limited practical—and FDA-cleared—applications for the use of AI in DR.
“One exciting area is around the use of AI to assist and augment radiologists in reading chest X-rays,” Sander says. For example, dynamic imaging, or serial radiography, allows radiologists to see the motion of fluids in the body and identify a wide variety of medical issues from atrial blood flow to urology or reflux issues. AI is now being viewed as an advantage for radiologists rather than a threat. Verna says AI promises features and capabilities including computer-aided detection of localized fractures, screening for diseases and conditions, and nodule detection in organs throughout the body. Aboujaoude says while AI talk is interesting, the problem is that it’s expensive and it could potentially push DR systems out of financial reach for many. In addition to AI, another trend is the growing use of analytics, which can help manage assets and staff performance and maximize DR investments. Verna says many imaging companies are developing algorithms that can analyze imaging data and identify specific abnormalities. These algorithms can help to inform the radiologist’s diagnosis. DR systems are also becoming more automated and contain more advanced features than ever before. This enhances the quality of imaging exams, which can deliver important diagnostic information to radiologists. Chad Rowland, executive product manager, global fixed radiography at GE Healthcare, says those looking to DR are seeking simplicity and efficiency, and that’s where the company is focusing its efforts. GE’s new software sits on a hospital network and automatically pulls data about rejected X-rays from the DR systems. Then, it automatically performs advanced analytics and allows customers to better understand the root cause of the rejected X-rays so they can take more targeted actions. 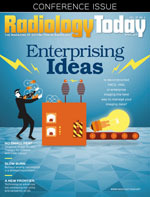 Today’s patients are constantly shopping around, which is why radiology providers need to increase their efficiency, improve workflow, and decrease cost to remain competitive. “Patient engagement and experience are taking center stage, and DR will help diagnostic radiology organizations achieve high levels of patient satisfaction,” Chopra says. D’Antonio says DR remains the backbone of diagnostic imaging, and medical centers are thinking about where they can maximize their investment in technology and be more efficient and more patient centric. Another trend is the importance of cybersecurity and a hardened IT environment to minimize, as much as possible, potential entry points into the health care environment through the medical equipment. For example, Siemens DR systems offer the ability to encrypt data at rest while they’re sitting in the environment, and the company has increased the ability to integrate to the active directory so that, when adding or removing staff, it can be done from a centralized location. Verna says ensuring data security for medical devices is essential. Cybersecurity is the responsibility of the facility as well as system providers that hold personal information. In the decade ahead, Sander foresees radiologists having more tools to assess anatomy and provide more detailed diagnoses in less time. These enabling technologies include advanced postprocessing applications, AI and machine learning, and the ability to view X-ray studies that move. Chopra believes that the future of DR will improve clinical outcomes, which will shorten exam times, enhance patient comfort, and eliminate antiscatter grids from portable exams. He also expects advances in antibacterial coatings to provide added protection against hospital-acquired infections. In addition, he expects interoperability between vendor-centric and standalone solutions to continue to develop. DR is not going away, and D’Antonio thinks the future will bring greater adoption of AI and improvements in automation and workflow. “A lot of technology you are used to seeing in other devices such as tablets and cellphones—ease-of-use technology—will be applied more towards health care and DR, specifically,” he says. Rowland sees this as a particularly exciting time for X-ray innovation. “It’s a 100-year-old modality, but the innovations that I think are coming over the next few years—due to things like automation capabilities, consumer electronic technologies being embedded into X-ray devices, and AI—are really changing the capability and the power of the imaging modality going forward,” he says.